Field firing is part of the continued progression in the development of combat shooting skills. This begins the soldier's critical transition from unstressed firing at single, known-distance targets to targets at various ranges for short exposures. It also requires the soldier to practice and refine previously taught skills. The TRADOC commander must approve any change to the authorized qualification courses. All questions concerning authorized qualification courses should be forwarded to: Commandant, U.S. Army Infantry School, ATTN: ATSH-INB, Fort Benning, GA 31905. Figure 6-1. Field Fire I and II. The ability to locate a combat target depends upon the observer's position, skill in scanning, maintaining observation over the area, and the type of indicators made by the target. When the firer gets in his position he must search his sector or lane, making quick glances at specific points rather than just sweeping his eyes across the terrain. The eyes are sensitive to slight movements that occur within the area the eyes are focused on. When the firer's eyes are sweeping an area they do not detect the slight movements of a concealed target. a. Selection of a Position. Depending upon the situation, the individual soldier may or may not select his own position. In most defensive situations, the soldier is told where to prepare his position. However, some situations, such as the attack and reorganization on the objective, require the individual to select his own position. A good position is one that offers maximum visibility of the area while affording cover and concealment. As used in this case, "position" is both the observer's location on the ground and the position of his body at that location. Instructors must continuously refer to and emphasize the importance of the observer's position when conducting practical exercises. b. Scanning. When a soldier moves into a new area, he must quickly scan the area for enemy activity that may be of immediate danger to him. This very rapid search lasts approximately 30 seconds and is known as the self-preservation method of search. The soldier makes quick glances at specific points throughout the area rather than just sweeping his eyes across the terrain in one continuous panoramic view. (1) If the soldier fails to locate the enemy during the initial search, he must then begin a systematic examination known as the 50-meter overlapping strip method of search. Normally, the area nearest the soldier offers the greatest potential danger to him. Therefore, the search should begin with the terrain nearest his position. Beginning at either flank, the soldier should systematically search the terrain to his front in a 180-degree arc, 50 meters in depth. After reaching the opposite flank, he should search over a second 50-meter strip farther out but overlapping the first strip by approximately 10 meters. The soldier continues in this manner until the entire area has been searched. (2) To take advantage of his peripheral vision, the soldier should focus his eyes on specific points as he searches from one flank to the other. He should make mental notes of prominent terrain features and areas that may offer cover and concealment to the enemy. In this way, he becomes familiar with the terrain as he searches it. (3) After completing his detailed search, the soldier may be required to maintain observation of the area. To do this, he should use quick glances at various points throughout the entire area, focusing his eyes on specific features. He should always search the area in the same manner to ensure complete coverage of all terrain. Since this quick search may fail to detect the initial movement of an enemy, the observer should periodically repeat a systematic scanning of the area as described above. This systematic search should also be conducted anytime the attention of the observer has been distracted from his area of responsibility. c. Target Indicators. A target indicator is anything a soldier (friendly or enemy) does or fails to do that reveals his position. Since these indicators apply equally to both sides of the battlefield, the soldier must learn target indicators from the standpoint of locating the enemy while preventing the enemy from using the same indicators to locate the soldier. These indicators can be grouped into three general areas for instructional purposes: sound, movement and improper camouflage. (1) Sound. Sounds, such as footsteps, coughing, or equipment noises, provide only a direction and general location making it difficult to pinpoint a target by sound alone. However, the fact that a sound has alerted an observer greatly increases the possibility that he will eventually locate the target through other target indicators. (2) Movement. The degree of difficulty in locating moving targets depends primarily on the speed of movement. Slow, deliberate movements are much more difficult to notice than those that are quick and jerky. (3) Improper Camouflage. The lack or improper use of camouflage and or concealment reveals the majority of targets detected on the battlefield. Such things as light reflecting from shiny surfaces or a contrast with the background presenting a clearly defined outline are indicators easily noticed by an alert observer. Three general indicators that may reveal a camouflaged and or concealed target are shine, regularity of outline, and contrast with the background. (a) Shine. Items such as belt buckles or other metal objects reflect light and act as a beacon to the wearer's position. This is as true at night as it is during the day. (b) Regularity of Outline. The human outline and most types of military equipment are familiar outlines to all soldiers. The outlines of rifles, helmets, and vehicles are all easily identified. The reliability of this indicator depends upon the visibility and the experience of the observer. On a clear day most soldiers can easily identify enemy riflemen or equipment if a distinctive outline is presented. At night or during other periods of poor visibility, seeing outlines is not only more difficult, but inexperienced troops will frequently mistake stumps and rocks for enemy soldiers. This is an additional reason for soldiers to become completely familiar with the terrain during periods of good visibility. (c) Contrast with the Background. If a soldier wearing a dark uniform moves into a position in front of a snow bank, the contrast between the white snow and the dark uniform makes him clearly visible. However, if he were wearing a white (or light colored) uniform, he would be more difficult to see. Contrast with the background is among the most difficult of the target indicators for a soldier to avoid. During operations in which the soldier is moving, he is usually exposed to numerous background colors. Since no one kind of personal camouflage blends in with all areas, a moving soldier must be continually aware of the surrounding terrain and vegetation. A soldier observes two enemy riflemen moving into completely concealed positions, one behind a bush and the other into a depression. By selecting a point of aim on the bush, the soldier should hit the enemy rifleman even though he can't see him. If the target cannot be engaged the aiming point also allows for quick and accurate engagement once a target is re-exposed. The enemy rifleman who moved into the depression provides no distinguishable aiming point. The soldier must then select a nearby feature as a reference point and determine its distance and general direction from the depression. A reference point provides a general aiming point on a concealed target. Of the two, an aiming point is usually the more effective means of delivering accurate fire. The difficulty in using reference points to mark targets moving from one location to another depends on the factors listed below. a. Number of Targets. If several targets appear and disappear at approximately the same time, it is very difficult to note the point of disappearance of each. b. Exposure Time of Target. Usually, moving targets are exposed for only a short period of time. Thus, the observer must be alert to note the point of disappearance for all of the targets. In such situations the soldier should mark the location of as many targets as possible before engaging any of them. By doing so, he will know the location of several targets and can engage each of them in rapid succession. c. Spacing of Targets. The greater the interval between targets, the more difficult it is to note the movements of each. When there is considerable distance between targets the observer should accurately locate and mark the one nearest his position and note the general area of the others. d. Good and Poor Aiming Points. Good aiming points are easily distinguishable in the surrounding terrain. Targets disappearing behind good aiming points such as manmade objects, large terrain features, and the like can be easily marked for future reference. Poor aiming points are not easily distinguishable within the surrounding terrain. Targets disappearing behind poor aiming points are difficult to mark accurately and are easily lost. If two targets offer about the same degree of danger to the soldier, but one disappears behind a good aiming point and the other behind a poor aiming point, the soldier should mark the location of the target behind the good aiming point and engage the other target first. Range determination is the process of finding the distance between two points. In most situations, one of these points will be the soldier's own position. The other may be a target or prominent feature. The ability to accurately determine range is an important skill needed by the combat rifleman to accomplish his mission. Not only does the accurate determination of range affect his combat marksmanship proficiency, it is also required to report information and adjust artillery and mortar fire. The methods of range estimation used during this period are as follows. a. The 100-Meter Unit of Measure Method. The soldier must be able to visualize a distance of 100 meters on the ground. For ranges up to 500 meters he determines the number of 100-meter increments between the two points. Beyond 500 meters the soldier must select a point halfway to the target, determine the number of 100-meter increments to the halfway point, and then double it to find the range to the target. (1) During training exercises, the soldier must become familiar with the effect that sloping ground has on the appearance of a 100-meter increment. Ground that slopes upward gives the illusion of greater distance and observers have a tendency to underestimate a 100-meter increment. Ground that slopes downward gives the illusion of shorter distance and the observer tends to overestimate. (2) Proficiency in the 100-meter unit of measure method requires constant practice. Throughout the training in this technique, comparisons should be made continually between the range as determined by the soldier and the actual range as determined by pacing or other more accurate means of measurement. The best training technique is to require the soldier to pace the range after he has visually determined it. In this way he discovers the actual range for himself, which makes a much greater impression than if he is simply told the correct range. (3) The greatest limitation of the 100-meter unit of measure method is that its accuracy is directly related to the amount of terrain visible to the observer. This is particularly true at longer ranges. If a target appears at a range of 500 meters or more and the observer can see only a portion of the ground between himself and the target, it becomes very difficult to use the 100-meter unit of measure method of range determination with any degree of accuracy. b. Appearance of Objects Method. The appearance of objects method is a means of determining range by the size and other characteristic details of the object observed. This is a common method of determining distances and is used by most people in their everyday living. For example, a motorist attempting to pass another car must judge the distance of oncoming vehicles based on his knowledge of how vehicles appear at various distances. Of course, in this example, the motorist is not interested in precise distances, but only that he has sufficient road space to safely pass the car in front of him. Suppose, however, the motorist knows that at a distance of one mile, an oncoming vehicle appears to be 1 inch wide and 2 inches high. Then, any time he sees other oncoming vehicles that fit these dimensions, he knows they are about one mile away. The rifleman can use this same technique to determine ranges on the battlefield. If he knows the characteristics, size and detail of personnel and equipment at known ranges, then he can compare these characteristics to similar objects at unknown ranges. When the characteristics match, so then do the ranges. (1) To use the appearance of objects method with any degree of accuracy, the soldier must be thoroughly familiar with the characteristic details of objects as they appear at various ranges. For example, the soldier should study the appearance of a man standing at a range of 100 meters. He fixes the man's appearance firmly in his mind, carefully noting details of size and the characteristics of uniform and equipment. Next, he studies the same man in a kneeling position and then in a prone position. By comparing the appearance of soldiers in these positions at known ranges from 100 to 500 meters, the soldier can establish a series of mental images that will help him determine range on unfamiliar terrain. (2) Training should also be conducted in the appearance of other familiar objects such as weapons or vehicles. Because the successful use of this method depends upon visibility, anything that limits the visibility (such as weather, smoke, or darkness) will also limit the effectiveness of this method. c. Front Sight Post Method. Using the front sight post as a scale is another method of estimating range. Generally, if a man-sized target is 1/2 the width of the front sight post, then the target is approximately 300 meters away. If the target is 1/4 the width of the front sight post, then the target is approximately 600 meters away. This method can be used for a quick on-the-spot estimation and engagement. Field-fire training provides the transition from unstressed slow firing at known-distance or feedback targets to engaging pop-up silhouettes from 50 to 300 meters. Two basic types of field-firing exercises are single-target and multiple-target engagements, which use 75-, 175-, and 300-meter targets. Once the soldier has developed the unstressed firing skills necessary to hit single KD targets, he must learn to quickly detect and engage combat-type targets at various ranges. Pop-up targets are used to add stress and simulate the short exposure times of combat targets. Therefore, the soldier must detect, acquire, and engage the target before the exposure ends. During field-fire training, the firer learns to quickly detect targets, apply SPORTS, and apply the four fundamentals simultaneously. The field-fire ranges consist of F-type silhouettes at 75 meters and E-type silhouettes at 175 and 300 meters. a. The field-fire range is fired from the supported firing position and the prone unsupported firing position. Initial training starts with single exposed targets and increased time for target exposures (Field Fire I). As soldiers become proficient, multiple target engagements are introduced with shorter exposure times (Field Fire II). There are two types of electronic pop-up targets used on a field-fire range: those that rise from the back to the upright position and those that rise from the side to the upright position. When using targets that rise from the side, soldiers should be instructed to wait until the target is fully raised before engaging the target. If the target is engaged as it is rising, the computer will not register it as a hit even though the target may fall. b. Soldiers who miss most targets should be removed from the firing line for remedial training if their problem cannot be corrected. A soldier who fires at a 300-meter target 10 times and misses it 10 times is obviously not learning but, instead, is losing confidence in his ability. The typical soldier should hit the 300-meter target at least 7 out of 10 times. c. Peer coaches should assist soldiers in observing the strike of rounds and identifying firing problems. If the target is missed and the coach cannot observe the bullet strike, the coach should instruct the soldier to aim lower for the next shot, expecting to see the strike of the bullet in the ground. With this information, the coach can instruct the soldier where to aim to hit the target. d. Live-fire training can be organized in several ways. A unit is divided into two or more firing orders based on the number of personnel to be trained. The first order is the firer, the second order is the coach and (if required) the third order is the scorer. At the conclusion of each exercise, positions rotate until all orders have fired. Standard field-fire scenarios have been developed to provide several target exposures. Although they are recommended for initial entry training, local commanders can develop any variety of more challenging target sequences. Ammunition is allocated based on one round for each target. e. During live fire, the soldier's hit-and-miss performance is recorded to facilitate the instructor-trainer's critiques or to indicate where more training is needed. The recorded performance is also used to determine which soldiers require closer supervision or remedial training. Two methods used to record firing performance are manually marked scorecards and automated computer printouts. (1) Manual Recording. When manual recording is used, the unit provides soldiers for recording information on either DA Form 3601-R (Single Target Field Firing Scorecard) or DA Form 5241-R (Single and Multiple Targets Field Firing Scorecard). (See Appendix B for blank reproducible copies of these forms). (2) Automated Recording. 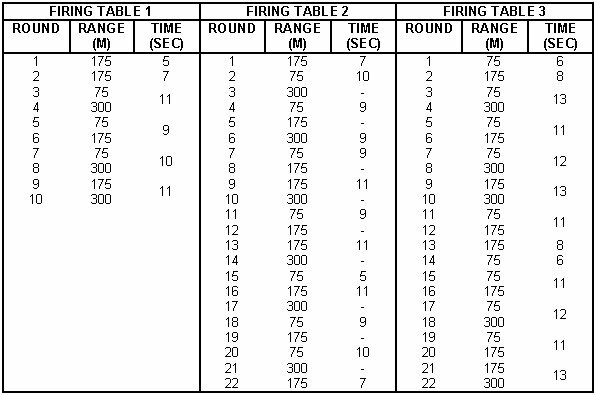 When firing exercises are conducted using the family of automated field-fire ranges, a computer printout is provided for each firing order. At the conclusion of each firing order, the range NCOIC completes the printout and ensures the soldier identification is matched with each firing point. He adds the soldier's name or roster number to the top of each lane/firing point data column. Based on a one-round allocation for each target exposure, data should be collected on hits, misses, no-fires, and repeated shots to assist the instructor-trainer in assessing firing proficiency. Field Fire I and II are part of the continued progression in the development of combat shooting skills. This begins the soldier's critical transition from unstressed firing at single known distance targets during downrange feedback, to targets at various ranges for short exposures. It also requires the soldier to practice and refine those skills that have been previously taught. This section introduces the need and techniques for scanning the range for targets, and quick accurate firing. a. Field Fire I (Single Timed Target). Field Fire I is broken down into three firing tables. Figure 6-2 shows the number of target exposures, target ranges, and exposure times for each firing table. Firing tables 1 and 2 are fired from a supported firing position, and firing table 3 is fired from the prone unsupported firing position. Figure 6-2. Field Fire I firing tables. (1) Firing table 1, consisting of 18 targets, helps the firer practice shooting skills and develop a sense of timing and a rhythm required to make the transition from KD to field fire. This builds confidence prior to firing the exercises in firing tables 2 and 3, and identifies soldiers who are having difficulty and need reinforcement. (2) Every firer is given 54 rounds of 5.56-ball ammunition with 18 rounds loaded into each of three separate magazines (one magazine per firing table). During firing tables 2 and 3, each soldier must demonstrate his ability to apply the fundamentals of marksmanship during the integrated act of firing by successfully detecting and engaging single timed targets. Each soldier must achieve 22 hits out of 36 timed target exposures. b. Field Fire II (Multiple or Single Timed Targets). Field Fire II consists of three firing tables. Figure 6-3 shows the number of target exposures, target distance, and exposure times for each firing table. Firing tables 1 and 2 are fired from a supported firing position and firing table 3 is fired from the prone unsupported firing position. Figure 6-3. Field Fire II firing tables. 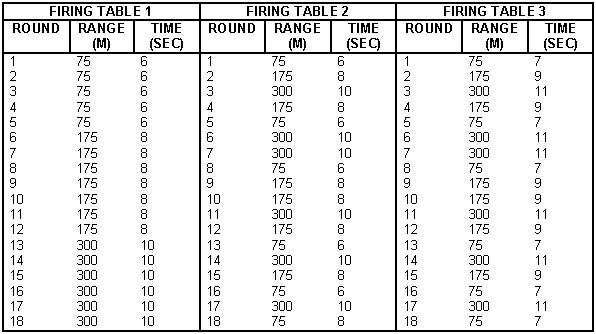 (1) Firing table 1, consisting of 10 targets, helps the firer practice shooting skills and develop a sense of timing and a rhythm required to make the transition from single timed targets to multiple or single timed fleeting combat targets. This builds confidence prior to firing the exercises in firing tables 2 and 3, and identifies soldiers who are having difficulty and need reinforcement. (2) Every firer is given 54 rounds of 5.56-ball ammunition with 10 rounds loaded into one magazine (for firing table 1) and 22 rounds loaded into each of two separate magazines (for firing tables 2 and 3). During firing of tables 2 and 3, each soldier must demonstrate his ability to apply the fundamentals of marksmanship during the integrated act of firing by successfully detecting and engaging multiple and or single timed targets. Each soldier must achieve 27 hits out of 44 timed target exposures. Qualification ratings and first-time GO rates are important during record fire, if properly used. They provide goals for the soldier and aid the commander in identifying the quality of his training. This should be considered in the assignment of priorities, instructor personnel, and obtaining valuable training resources. The objective of record firing is to access and confirm the individual proficiency of firers and the effectiveness of the training program. Although the soldier receives a practice rating based on the number of target hits, practice record fire should also be considered a valuable training exercise. When practice record fire is correctly conducted, all soldiers gain valuable experience and become more confident in engaging combat targets (Figure 6-4). Figure 6-4. Practice record fire. a. Concept. During Practice Record Fire I and II, each firer will receive 40 target exposures at ranges from 50 to 300 meters and 40 rounds of 5.56-mm ammunition. Twenty rounds will be fired from the foxhole supported and twenty rounds will be fired from the prone unsupported firing positions. Each soldier must hit a minimum of 23 out of 40 target exposures. The soldier must thoroughly understand and apply the fundamentals of marksmanship so that he can accurately detect and engage combat targets on the battlefield. Coaching or assistance to firers will be permitted only during Practice Record Fire I. If a firer is consistently missing targets or having problems with target detection and range estimation, coaches should tell him what he is doing wrong so he can correct the shooting error. Target detection will be accomplished with a dry-fire scenario before engaging targets. 1. If possible, Practice Record Fire I and II should be fired on different ranges. Soldiers firing Practice Record Fire II on the same range as Practice Record Fire I must fire on a different lane. 2. Practice Record Fire I and II should closely resemble all aspects of actual qualification. Practice Record Fire I allows peer coaching and the use of dummy ammunition. Practice Record Fire II does not allow peer coaching and dummy ammunition will not be used. b. Conduct of a Practice Record Fire Range. During practice record fire, soldiers fire at 40 single or multiple target exposures. They are issued 20 rounds of ammunition to be fired from the foxhole supported fighting position, and 20 rounds to be fired from the prone unsupported position. Based on the total number of hits achieved in each table, soldiers are critiqued on the practice record fire score. Exposure times are three to seven seconds at ranges of 50 to 300 meters. Since it requires one to two seconds for the manually activated target mechanism to raise the target, timing begins when the target is fully exposed rather than when the tower operator activates the target switch. When practice record fire is conducted on the new family of automated record fire ranges, these factors are included in the computer program. (1) Alibi Firing. Alibi firing should be conducted at the end of each firing table IAW the tower operator commands. Alibis are provided during practice record fire for three reasons: malfunction of the rifle, malfunction of the target mechanism, or faulty ammunition. (2) Uniform and Equipment. Soldiers do not need to wear full field equipment while firing the practice record fire course. Wearing helmets and LBE have little or no effect on performance. Local commanders could require that they be worn. If so, the same equipment should be worn during the official record fire. (a) Orientation Area. This area is located so firers cannot see the firing area. Practice record fire orientation includes conduct of fire, instructions on safety, and range operations (procedures in ready and retired areas). (b) Ready Area. This area is near the firing range and located so firers cannot see targets on the range. The firer blackens the rifle sights, lubricates the rifle, and checks for defects that might cause malfunctions. (c) Retired Area. This area is about 100 meters behind the ready area. Soldiers completing practice record fire move to the retired area to clean their rifles and be critiqued on their firing performance. Marksman: Hits 23 to 29 targets. Sharpshooter: Hits 30 to 35 targets. Expert: Hits 36 to 40 targets. What test was used (standard, known-distance, or scaled)? How was the test administered? How were individual and unit performances distributed (23 to 40 or 26 to 40 for alternate), and at which target ranges? a. Concept. Since all soldiers must fire the record fire course at least once a year for qualification, the record fire course can provide excellent firing performance evaluations. It also provides excellent diagnostic information for instructors-trainers who are concerned with scheduling training to overcome the most serious firing weaknesses. The standard course should be used for all soldiers. There are times when a qualification exercise must be conducted on an alternate course. (1) The following information concerning the development of the record fire course is provided to assist in understanding how standards were established. (2) Testing and development indicates the soldier should hit at least 39 of 40 targets if he applies the marksmanship fundamentals correctly (assuming target mechanisms have been checked and are functioning). This probability of hit (PH) is provided as a guide considering the capability of the typical rifle, ammunition, and soldier firing a standard course (Table 6-1). Table 6-1. Probability of hits. (3) When the IET BRM POI or an adequate unit training program is conducted, the following PH can be expected (Table 6-2). Table 6-2. Results from an adequate unit training program. (4) The first task on a standard record fire course is to ensure all targets function properly. When in doubt, a lane should be fired to ensure a bullet strike will activate each target. Sometimes slapping a target with a cleaning rod can cause it to activate, but a bullet will not. When it is hot, plastic targets may allow the 5.56-mm bullet to pass through without causing sufficient vibration to activate the mechanism, resulting in a requirement to change targets more often, to use double targets, or to use different silhouettes for a positive indication of hits. b. Conduct of Record Fire Range. The record fire course provides for the engagement of two-20 round exercises. Twenty single or multiple targets are engaged from the foxhole supported fighting position. Twenty targets are engaged from the prone unsupported position. Once firing begins, no cross loading is allowed. (1) Credit for targets hit should not be given when bullets are "saved" from difficult targets to be used on easier targets for example. Not firing a 300-meter target so an additional bullet can be fired at a 150-meter target. However, when double targets are exposed, the soldier should fire two bullets. If the first target is missed, he may fire at that same target with the second bullet. (2) Engage the target that poses the greatest threat first (normally assumed to be the closer target), no scoring distinction is made between near targets and far targets or the sequence in which they are engaged. Credit is not given if unused ammunition from one 20-round table is added to the magazine provided for the next table. (3) Soldiers who fail to qualify on the first attempt should be given appropriate remedial training and allowed to refire in a few days. When a soldier refires the course, he will be unqualified if he hits 22 targets or less and will be rated as a marksman if he hits 23 to 40. When automated scoring procedures are available that allow the performance of the soldier to be stored and retrieved before the malfunction, his performance is added to the score of his first attempt after weapons repair and refire. If a soldier's weapon becomes inoperable and his performance before the malfunction precludes qualification he is considered unqualified and must refire. (4) Alibi firing is reserved for those soldiers who have encountered a malfunctioning target, ammunition, or rifle. A soldier will not be issued more than 20-rounds of ammunition for each table. If he fires all 20 rounds despite a target malfunction, he will not be issued any additional alibi rounds. There are no alibis for soldier-induced weapon malfunctions or for targets missed during application of immediate action. The following are the procedures that must be strictly adhered to when a malfunction occurs. The ammunition procedures, allocation, and alibi procedures for practice record fire and record fire are conducted the same. The only exception is that coaching is authorized for practice record fire. (a) The soldier must apply immediate action and continue to fire the exercise. After firing, the soldier notifies the NCOIC to determine if the ammunition was faulty or if the target malfunctioned. (b) The NCOIC verifies the malfunction. The soldier is permitted to fire at that target(s)with the exact number of rounds equal to the target malfunctions. For example, the soldier had two confirmed target malfunctions at 250 meters. Although he may have had five rounds left from the overall exercise. The soldier would be given only two rounds to engage the two 250-meter target exposures, if repaired, or the next closer target. He would not be allowed to fire all remaining five rounds at the two 250-meter target exposures. (c) The NCOIC or scorer monitoring the lane must verify the target malfunction. The soldier continues to fire the exercise. On a computerized range, the tower operator confirms which target and how many malfunctions occurred. (d) Inoperable weapons are uncorrectable malfunctions such as a broken firing pin, jam caused by double feed not caused by the soldier, failure to extract due to broken extractor, or round in the bore. The soldier must apply correct immediate action to eliminate the stoppages. If the stoppage is determined to be correctable for example, the soldier did not apply correct immediate action and as a result the soldier did not engage the required number of targets, he is at fault. (e) Qualified weapons personnel or the NCOIC must verify weapon malfunctions before the soldier can refire the course. Soldiers who erroneously claim a malfunction on the firing line are considered unqualified and refire as a second-time firer. Failure to scan the designated area. Lack of ability to detect targets. Lack of ability to shift from one target to another. Units should conduct rifle qualification on a standard record fire range. Convenience and comfort should not be the prime consideration when choosing a range. The KD alternate course is used by all components of the active Army, US Army Reserve, and Army National Guard when a standard record fire range is not available. The 25-meter alternate course is used when neither a standard record fire nor a KD range is available for rifle qualification. Units are permitted to use the 15-meter scaled alternate course only if a 25-meter range is not available. a. 25-Meter Alternate Course. The 25-meter alternate course provides a way for units to test a soldier's rifle marksmanship proficiency. (1) A soldier undergoing rifle qualification should first confirm the zero on his rifle before engaging the alternate course. The zero may be confirmed with the 25-meter battlesight zero procedure of six sighter rounds, which are fired in the prone supported position. Sighter rounds do not count for score. Training or sustainment ammunition is used for sighter rounds if a zeroing exercise is not conducted the day of record fire. (2) Firing at scaled silhouettes gives the soldier the chance to engage targets with time limits and feedback. Engaging targets at 25 meters precludes any training value received on target detection or the effects of wind and gravity, which is learned when firing at longer distances. Rifle qualification requirements are scheduled on the 25-meter alternate course when a standard record fire or KD range is not available. The alternate course is an eight-hour course of instruction with four hours for 25-meter zeroing and four hours for record fire. Informs the chief range officer of crossfires. Informs the chief range officer of allowable alibis. Accurately counts hits and misses. A hit is any bullet hole that is either completely in or touches some part of the scaled silhouette. If a bullet hole does not touch some part of the scaled silhouette, it is counted as a miss. Ricochets are counted as hits or misses. Counts only two hits for each silhouette for score in each table. Assists the soldier with target repair. Totals, signs, and returns the completed scorecard to the chief range officer. Expert: Hits 38 to 40 targets. Sharpshooter: Hits 33 to 37 targets. Marksman: Hits 26 to 32 targets. Unqualified: Hits 25 and below.